Flipping through the Acme circular and found a few coupon match-ups that end up being some cheap buys!! The sale runs thru Thursday 2/5. *Totino's Pizza Rolls (15 count).....On Sale 10 for $10 **Use the .35/1 coupon (doubles to .70) from the 1/11, 1/18, or 1/25 SmartSource coupon inserts to pay just 29 Cents a Box!! *Soft Soap Liquid Hand Soap, 7.5 oz., selected varieties....On Sale 10 for $10 **Use the .35/1 coupon (doubles to .70) from this weeks coupon inserts to pay just 29 Cents for it!! *Knorr Lipton Side Dishes (4 to 5.7 oz. pkg.) Noodles, Rice, or Veggie...On Sale 10 for $10 **Use the .75/2 coupon (doubles to $1.00) from the 1/18 Red Plum insert to pay just $1.00 for 2 packs! *Pringles Can of Potato Chips (5.12 to 5.75 oz.) select varieties.......On Sale 10 for $10 **Use the .20/1 coupon (doubles to .40) to pay just .60 for the can! Simply answer a few quick questions to receive two coupons — one for a free Ensure 8-fl-oz shake and one for savings on the many flavors and varieties of Ensure six-packs. You can print the coupons right away or they can be mailed to you. You can fill in your mailing info here. Would You Mind An Old Label??? It appears that Bath & Body Works is re-doing all of their labels for their Signature Collection products. So they are trying to move out the products still left in stock with the old labels. If the label is not important to you (me either...LOL) than you can really get some deals!! After you add any of the full size Signature Collection products to your cart you will see the price drop to just $3.00 per product at checkout!! A great deal!! The regular price on most products is about $9.50-$10.50. They still have alot left in many scents...lots of shower gels, lotions, body splash, bubble bath, body creams, and more!! Better hurry though....as I am sure at these prices the products will sell out quickly!! You can view all of the Signature Collection products here. These are great to have on hand for upcoming Mother's Day baskets, teachers gifts, or when you need a nice quick gift last minute!! Also if you spend $15 or more....add any Optimism product to your bag and use code OPTIMISM to get they item FREE (Up to $13.00 value). You can view all of the Optimism products here. **Just to give you an idea on the shipping....I had 6 items in my cart and shipping was $6.99. So it adds about a dollar an item roughly. Looking for something fun, festive, and free to do this weekend? With the kiddies in mind, of course!! How about heading over to your local AC Moore tomorrow for thier Make N Take Jewlery Craft. You can learn how to make jewlery for Valentine's Day....fun for both parents and kids together. Just stop by tomorrow from 1pm-3pm to participate. **Remember...Aldi's does not accept manufactures coupons!! Looking for an Aldi's near you...click here. 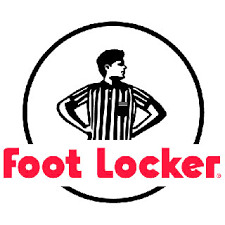 Save 30% off your entire purchase at Footlocker (Lady and Kids too!) with this printable Friends & Family Coupon here. Better hurry though.....coupon expires tomorrow!! Thanks to reader SkyLaur, yesterday she left a comment about how her local Old Navy store was taking an additional 50% off Baby and Toddler already marked Clearance prices. So I made a run to check it out. Not only was my local store offering 50% off already clearance priced Baby and Toddler clothing items, but also Men's and Women's clearance items too!! I was a bit short on time on my trip.......but managed to get a few great buys. For a Grand Total of Just $28.71 OOP. An awesome deal for the 9 items!! I love when Old Navy has their winter clearance deals each January...as this is a great time to stock up for next winter!! Let me know how you make out if you get a chance to go!! C'mon brag a bit!! The Easiest, Yummiest French Toast!! My sister used to work at a Bed & Breakfast many years ago and shared this great recipe with me a while back. It takes an old favorite French Toast and gives it a bit of a twist!! I have made it time and time again, each and every time tasting more delicious than ever!! It's so simple and easy to make too!! Simply take a piece of bread and smear some cream cheese on it....be a little generous...but not too heavy! Then take another piece of bread and place it on top of the cream cheese to make a sandwich. Then dip the sandwich in the egg dip. Make a few of these....we usually eat one per person as they are very filling. Then place in a heated frying pan, we spray a little Pam on the pan first. Brown a little on each side then remove from pan cut in half, and sprinkle the top with a dash of confectioners sugar. Top with a small dab of butter and a little syrup. We also usually serve with a side of strawberries or fruit salad. You can see many more Thrifty Thursday posts over at The Thrifty Jinxy. Do you always forget the last time you were at the salon for your hair cut? Or are you like me and remember the day before a special occasion your going to be attending? Well Supercuts would like to help you remember with their New Haircut Reminder Service. You can choose how frequently you would like your reminders sent to your inbox, plus be one of the first to know about special offers too. You can sign up here...it's quick and easy. And as a "Thank You" for signing up Supercuts will email you a coupon for $2.00 off your next adult haircut within just a few minutes!! Here are just a few pictures of our trip........until next time we get to go!! Lots more Wordless Wednesday pictures can be seen here!! Have a great day!! Do not ask me what I was thinking when I was so excited to get a black stove in my kitchen a little while back. I had previously had a white stove and it was very hard to keep clean....especially being gas and all!! So I thought black was the way to go!! We use our stove daily for meals so it can really get a bit dirty in no time at all!! I hate to use a green pad on the stove, in fear that it may scratch the stove top.....(As per the owners manual...and I am too chicken to try one on it!!) So I needed to find another alternative way to keep my stove top clean. So now I buy a Mr. Clean Magic Eraser....cut it into about 5 even pieces and use that to clean off any goop left on my stove after meals. It works great!!! And not a scratch at all is ever left on my stove!! The magic eraser is so soft. Plus, there is no need for chemicals either!! And here is the after shot: Shiny and Clean!! Here is the piece of Magic Eraser that I used to clean the stove off with.......Yuck!! 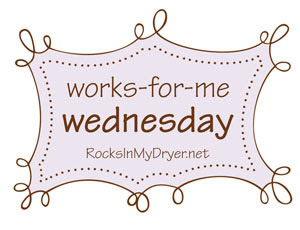 Lots more Works For Me Wednesday's can be seen over at Rocks In My Dryer!! Have a Corner Bakery Cafe nearby? Sign up for their E-Cafe Newsletter to keep up with the all the latest happenings and as a thank you for signing up they will send you a coupon good for a FREE cookie! To find a location near you or to sign up click here. Just a reminder.....Today Panera Bread is giving away free coffee and samples!! Click here for all the details!! The Children's Place currently has their Monster Sale going on.....with an additional discount of 50% off already reduced merchandise prices!! Plus to save even more use coupon code SA19 at checkout to save an additional 15% off your purchase. This is a great time to stock up on items for next winter!! Be sure to check out the selection soon....as items usually sell out fast!! As Valentine's Day is quickly approaching this is a great time to keep the kiddies busy with upcoming holidays crafts, cards, puzzles, and activities!! What could be nicer to show thier love to someone than a handmade craft or card? I know I just love the crafts my kiddies make for me......and the look on their faces when they hand it to me so proud of what they have made!! There is nothing better!! There are lots and lots of great Valentine's craft ideas...and many of them can be printed for free right from your home computer!! Here are a few great sites I have used over the years that offer some really creative craft ideas.....at many different age levels!! Valentine's Day Crafts at Kaboose- They have many paper crafts, table decoration ideas, cute recipe ideas, and more!! DLTK's Valentine's Section- They have cards to print and decorate, games, puzzle to do, worksheets, posters, and more!! Family Fun's Valentine's Ideas- A wonderful collection of sweet Valentine's Day printables, including coloring pages, lunch box notes, adorable stickers and much more! Kids Free Crafts- lots of great paper crafts, Valentine's hats to make, Card holders, and more!! All Kids Network- Lots of great homemade Valentine's craft ideas and activities for the kiddies to make. These should keep your little ones busy as a bee making all sorts of Valentine's crafts and cards straight thru the holiday!! Have any other great Valentine's craft sites for the kiddies to recommend?? Starting this Friday January 30th thru Sunday February 1st IKEA is offering FREE Breakfast each morning until 10:30 am!!! Limit one free breakfast per person. Each customer will receive one free small breakfast and a cup of coffee. While supplies last. This offer is not valid at IKEA Pittsburg, IKEA Direct, IKEA Houston, and IKEA Hicksville. The Superbowl is fast approaching and Kraft would like to give you a chance to win $15 worth of coupons good for FREE Kraft products!!! You can enter each day through 2/2/2009. Click here to have your chance!! It's Monday....not to worry it being Monday can be a good thing!! Especially if you would like to watch a movie tonight....and for free!! Here is your FREE movie rental code for today from Redbox. Simply enter promo code 57VH9L at checkout. Remember this code is only valid today until midnight tonight!! New to RedBox....click here on how it works!! To find a Redbox location near you click here. Have You Joined The Cranberry Club?? Are you a cranberry lover? Are you always looking for new recipes that include cranberries in them? Well then perhaps you should join the cranberry club from Ocean Spray. Simply sign up here to be informed of new recipes, new products from Ocean Spray, helpful health tips, and lots of other info. Great Deal on Ground Beef!!! If you are low on your ground beef stockpile and have a Wegman's nearby you are in luck!! This week thru Saturday 1/31 Wegman's has 90% lean ground beef on sale for just $1.99 a lb. (sold in 6 lb. packages) I picked up some yesterday and it looked so fresh!!! I can only usually get 80% lean for this great price!! Perhaps your making chili for your Super Bowl party this weekend??? Here are this week's coupon match-ups for ShopRite this week. Sale runs thru Saturday 1/31/2009. -Totino's Pizza Rolls......5 boxes for $5.00 **Use the .35/1 (doubles to .70) coupon from today's coupon inserts to pay just 35 cents for the box!! -Friendship Sour Cream.....$1.09 each **Use the $1.00/2 coupon from today's coupon inserts to pay just $1.09 for 2 containers or 59 cents each!! -Hefty Trash Bags (10-18 count box )......$1.49 **Use the $1.00/1 coupon from this week's Red Plum coupon insert to pay just .49 for the box!! -Pert Plus Shampoo (any variety).....$1.99 **Use the $1.00/1 coupon from today's Smart Source coupon inserts to pay just .99 cents for the bottle! -Post Fruity or Cocoa Pebbles Cereal......$1.99 a box **Use the $1.00/2 coupon from today's Smart Source coupon insert to pay just $1.50 for each box! -Hefty Foam Plates and Bowls......$1.77 each **Use the $1.00/1 coupon from the 1/18 Red Plum insert to pay just 77 for a pack!! -Kellogg's Cereals (selected varities)....$1.88 a box **Use any of the $1.50/2 coupons from the 1/18 coupon insert to pay just $2.26 for 2 boxes of cereal!! -Kraft Salad Dressing (1 pt. bottles).......2 for $4.00 **Use the $1.00/2 coupon from the 1/18 Smart Source coupon insert to pay just $$3.00 for 2 bottles! -Hellmann's Mayonnaise (squeeze bottle or jar).....$2.99 each **Use the .60/2 (doubles to $1.00) coupon from the 1/18 Red Plum inserts to pay just $2.49 for each jar!! -Frank's Buffalo Wing Sauce (12 oz. )....$1.29 **Use the $1.00/2 coupon from the 1/18 Red Plum insert to pay just $.29 for each bottle!! They are the highlights for the week that I found. Did you see any others?? If so please leave a comment to let us know!! The Best Baked French Toast Ever!! For the Locals.....Pay the Weather, If You Dare!! Have a KB Gift Card in Your Wallet?? Popular All-You-Can Eat Pancakes are Back!! Quaker Deal at Acme Markets!! Just in Case You Still Need Toys?? ?